There may be situations where you may wish to amend data relating to a survey respondent from your Snap WebHost data, for example when an individual exercises their right to rectification. This worksheet outlines how to amend a respondent’s submitted response data and any respondent details used for the email invites/logins list. There are some circumstances where you may need to amend individual data cases from your Snap WebHost data. You can do this by downloading all the data from Snap WebHost to the desktop version of the survey, amending the data in the desktop version and then reloading it back into Snap WebHost. This worksheet outlines the process. Amend the relevant data (eg. the repondent’s response data) in the desktop software. This can be done via the data entry window. Open the data entry window. Click to open the data entry window. Find the case, and then amend the data as necessary. 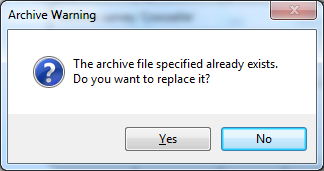 Click [Yes]. 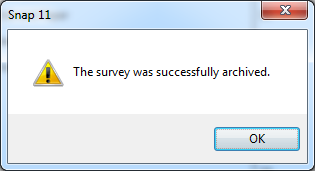 This will overwrite the previous archive of this survey. If you have created other archive files or exported data to other software packages that contain the data you have to amended, you will also need to update those files. Now the data with the amended case(s) can be added back into Snap WebHost. Note: To fully amend the data, any previously created archive files/ cloned surveys/ back ups you have made which specifically identify that individual will also need to be amended. You may also need to re-run any reports which specifically identify that individual. Note: After reloading the archive, the Completes and Cases figures will be different. Note. If you have uploaded multiple database files to your survey already, create a new database with just the necessary respondents details, clone the existing database link and select the new file. Now follow the steps below starting from step 3, at step 9 when you are uploading the new file select Modify. Set to the Upload respondent action to Update All. If you are unfamiliar with these options, click here for further explanation. This will ensure that the respondent is updated in the respondent list in Snap WebHost.